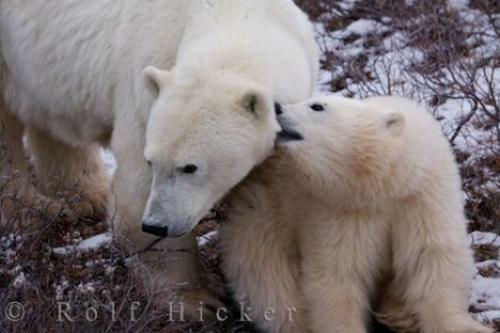 A Polar Bear family consisting of a sow and her cute cub, spend a bonding moment on the icy tundra of the Churchill Wildlife Management Area in Churchill, Manitoba. A mother Polar Bear lets her cute little cub pull on the fur on the side of her neck while taking a short break on the icy tundra. The family closeness only lasts for two or three years and then the cub will be old enough to fend for itself when winter arrives around Churchill, Manitoba.Polar Bear, Ursus maritimus, sow and cub in the Churchill Wildlife Management Area, Hudson Bay, Churchill, Manitoba, Canada. Photo of a cute Polar Bear cub chewing on its mother's fur in this family portrait taken in Churchill, Manitoba in Canada. This picture is part of the photo album "Polar Bear Pictures" - there are more beautiful images waiting for you.